A mother wrongly jailed for murder after the cot deaths of her two baby sons has been awarded a ‘substantial’ six-figure compensation payout. Angela Cannings spent 20 months in prison over the deaths of seven-week-old Jason and 18-week-old Matthew but was released after evidence given by controversial paediatrician Sir Roy Meadow was discredited. Legal experts estimate the payment will be between £250,000 and £500,000, although there is no limit on the total. 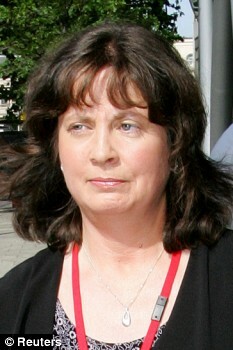 Mrs Cannings had been denied a payout on two previous occasions, both in 2005, when Home Office lawyers reportedly ruled she was not eligible for compensation because she had not been ‘completely exonerated’ by the appeal, although enough doubt had been cast on the prosecution’s case to free her. However, 44-year-old Mrs Cannings has now been successful in winning compensation, The Mail on Sunday can reveal. It is unclear whether the Ministry of Justice now accepts that she has been exonerated but Justice Secretary Jack Straw does have the power to use his discretion. He will have decided her compensation with the help of an independent assessor, based on her loss of earnings during the two years she waited for trial and her period in jail. However, because she was in a relatively poorly paid job as a shop assistant, it is believed that the bulk of Mrs Cannings’ compensation will have been justified by the effect on her mental and physical well being, and on her family life. In her memoirs, Mrs Cannings described how she found it difficult to resume normal life with husband Terry and their daughter Jade, now 12, after her release. She recently split from Terry, 53, after 20 years of marriage, and last month, she bought a mortgage-free £187,000 three-bedroom home in Saltash, Cornwall, near her former family home. Mrs Cannings was one of several women who were wrongly convicted following evidence given by Professor Meadow. During the earlier trial of solicitor Sally Clark, also wrongly convicted of murder, the paediatrician told the court that the chance of two cot deaths in one affluent family was one in 73 million. In 2005, he was struck off by the General Medical Council over his misuse of statistics but was later reinstated after a court appeal. Mrs Cannings was given a life sentence in April 2002. She was released in December 2003 after the Court of Appeal decided there was not enough evidence that the boys – who died in 1991 and 1999 – had been smothered. Mrs Cannings had always insisted the boys were victims of cot death, like her first born, Gemma, who died in 1989 at the age of 13 weeks. The case was re-opened after an investigation found three previous cot deaths in the family, suggesting a genetic cause. Her family life came under further strain in 2006 when Angela’s prison friend Rose Swan, 47, stayed with the Cannings for three months following her release from a life sentence for killing her violent partner. Mr Cannings, who has suffered depression, called Rose ‘disruptive’ and ‘volatile’. Last night, Mrs Cannings declined to comment. Her solicitor, Bill Bache, said he could not reveal the compensation package without her permission.